Police in Northern Ireland have disputed the Irish President’s claim that he had to travel to Belfast by private jet because they could not provide security for him to journey by road. Michael D Higgins said his staff were advised “that for security reasons I couldn’t be picked up at the border” during last May’s trip. He is running for a second term as president and the election will be held on Friday. Mr Higgins made his claim about his travel arrangements during a televised presidential debate on Wednesday evening. In May, he spoke at Queen’s University Belfast on the 20th anniversary of the Good Friday Agreement around the concepts of remembering, forgiving, forgetting, and imagining. 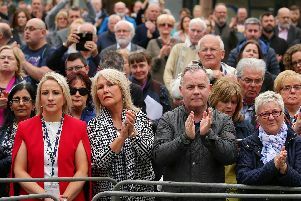 Sinn Fein presidential candidate Liadh Ni Riada challenged President Higgins about his claim. She said: “During a presidential debate on The Pat Kenny Show on Wednesday night Michael D Higgins claimed that his staff were advised ‘for security reasons’ that he couldn’t be picked up at the border. He flew to Belfast in a Lear Jet, funded by the taxpayer, while his car was driven from Dublin to Belfast to pick him up at the airport. “That claim has now been directly disputed by the PSNI. They reject this ‘security’ claim who say it would be ‘inconceivable’ that the President of Ireland would not have been afforded security if it had been requested. “It is clear now that Michael D Higgins claim has caused considerable anger within the PSNI. Another candidate, the Londonderry-born businessman Peter Casey, has suspended his campaign for this weekend as he reflects on whether to continue in the race. He caused controversy when he challenged the right of Irish Travellers to be classed as members of an ethnic minority.